There are microtransactions in Assassin’s Creed Origins, as there have been in the last two big installments of the series. The game’s publisher, Ubisoft, says that most of what you can spend them on can be obtained just by playing the game, though it’s a little more complicated than that. Origins’ in-game store, which is not yet fully live in the PS4 copies we have at Kotaku, lists several types of purchasable content. These items are sold for Helix Credits. You get 500 Helix credits if you buy the game’s $40 season pass and 200 for finishing the game’s prologue. Other than that, you’ll have to spend real money to get them. In the gear section of the store, a unicorn mount goes for 500 Helix. A legendary-grade Lord of Bones predator bow goes for 250. In the time-saver part of the store, you can reap the rewards of leveling up faster by just spending 300 Helix on three ability points, which unlock skills in the game. Or you can spend 1000 Helix to obtain 300 units of each of the game’s six crafting materials. Buy these only if you’re not satisfied with the billion swords and bows that keep dropping as you play through the game. 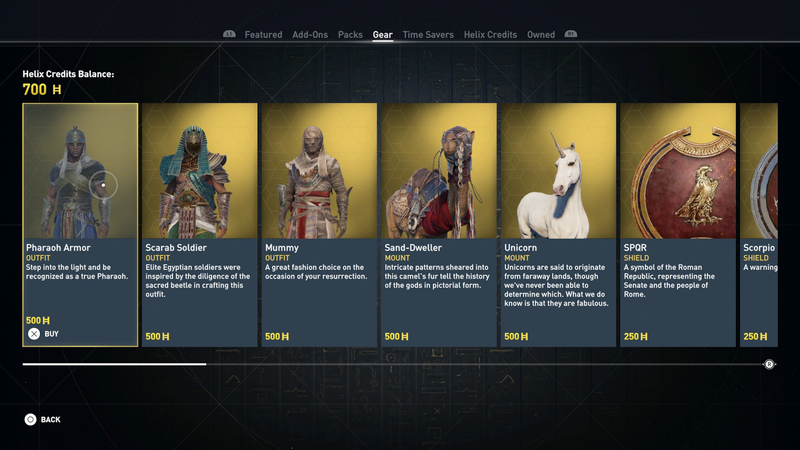 The rep told us, as has been reported before, that “In Assassin’s Creed Origins, anything that players can purchase with real money is also unlockable by just playing the game.” Things like the crafting materials, for example, can be obtained by hunting animals in the game’s vast Egyptian wilderness or by disassembling the many weapons that defeated enemies drop. That bow you can buy can also turn up in the game as a drop. Maps that show you where the game’s hidden locations are can only be obtained through Helix credits this time around. The maps aren’t required to finish the game and are basically a shortcut to finding stuff you can’t track down naturally. They sell for 200 Helix each or in a bundle for 400. One of the great pleasures of Origins is exploring the map and discovering things for yourself, at least. ACO’s version of a lootbox. While not new to the Assassin’s Creed series, in-game microtransactions have become more prevalent (and controversial) recently, notably with the inclusion of random “loot boxes” in fall games like Middle-Earth: Shadow of War and the upcoming Star Wars: Battlefront II. It’s understandable why people don’t like loot boxes: they’re rooted in gambling psychology and fundamentally exploitative. Origins has lootboxes, too, though they are sold only for in-game currency (which, yes, can also be purchased with Helix). Origins ’ microtransactions in the game’s store at least tell you exactly what you’re paying for. If you want to buy this stuff, that’s fine, but you probably won’t feel the need to. You’ll get plenty of cool bows and horses by just playing normally. It’s just a shame about those maps.